Bookman Beattie - Where did you get the idea from to write such a book? 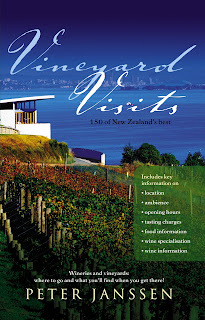 Author - When I was researching my 1001 Best Things To Do and See book I very quickly became aware of the extent to which the New Zealand wine industry has grown. While like most New Zealander's I was aware that the New Zealand wines have gained a world wide reputation and of course had been to the occassionally winery lunch I was surprised at the sheer number and more importantly the quality of our wineries. Not only are we producing international class wines, but New Zealand wineries are also leading the way in superb New Zealand cuisine and innovative architecture. While there are more than a few wine guides on the market, there was very little for the more casual wine drinker for whom the winery experience is possibly even more important than the wine. This impression was confirmed by the wineries themselves who recognise that wine buffs only make up around 5% of their visitors. I wanted to keep each entry relatively short and the book small so it was easy to carry about. Question: How long did it take you to visit so many wineries? Answer: In all it took me six months. There are now over 500 wineries in New Zealand, though many are not open to the public, open by appointment or only open for very limited periods. For instanceMartinborough primarily caters for the Wellington weekend trade and anyone visiting on a week days would find most of the wineries closed which is very frustrating for tourists in particular. I only included wineries that were consistently open to the public at least through the summer. So in the end I would have visited around 250 wineries. Question: Did you visit region by region? Answer: Yes, that was the most logically way to do the research and allowed some reasonable comparasion between each of the wineries. Question: Do you plan to update the book on an annual basis? Question: Since you retired from publishing you have been busy as an author. What other subjects have you been writing about? Answer: Retired ? I have only changed occupations and now finding the guide book business taking up a substantial amount of time. Currently I am working books covering, food, pubs, walking and the quirkier aspects of New Zealand. Question: How do you find as a former publisher being on the other side of the fence as an author? Answer: I certainly is a bit strange dealing with former colleagues as an author especially when it comes to contracts !. However, I have come to love editors with a passion. They are such talented people with such good manners and are so gracious when pointing out possible errors. Finally Peter is there anything else you would loikie to add? While I am a wine drinker by choice, I actually knew very little about wine making and the industry in general. The book also contains basic wine information for those a bit daunted by the wine industry.